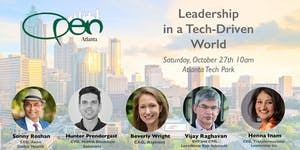 OPEN Atlanta's Eighth Annual Event will be on Saturday, October 27th at the Atlanta Tech Park! We are lucky to have technology executives, entrepreneurs and business leaders share their outlook on business and leadership in today's tech-driven world! Please purchase tickets in advance as seats are limited! Vijay Raghavan is Executive Vice President and Chief Technology Officer for the Risk and Business Analytics division of RELX Group, which includes LexisNexis Risk Solutions and Reed Business Information (RBI). In this position, he is responsible for software development, R&D, information systems, security and data center operations. Having spent almost 30 years in Information Technology, Raghavan has extensive experience in the management of diverse technology functions, with oversight of the full software development lifecycle and support functions for high-availability applications which are powered by high-performance supercomputing platforms. Raghavan holds a B.E. in Electrical & Electronics Engineering from the Birla Institute of Technology and Science, and completed an Advanced Executive Education Program in Management, Innovation and Technology at MIT's Sloan School of Management. Henna Inam is the CEO of Transformational Leadership Inc., a company that helps Fortune 500 organizations grow transformational leaders. She is a former C-suite executive who drove transformation throughout her corporate career including roles such as: Global Head e-Innovation at Novartis, Chief Marketing and Innovation Officer, Region President for the Americas, and Country General Manager in Mexico. Henna founded Transformational Leadership Inc. in 2010 to help organizations developauthentic and agile leaders who create cultures of innovation, trust, inclusion, and growth. She is a trusted advisor to C-suite leaders globally. Clients are Fortune 500 companies including CNN,The Coca-Cola Company, E. W. Scripps, TSYS, AMC Theatres, The Home Depot. Henna has 20 years of experience working at Procter & Gamble and Novartis, including functional experience in Marketing, Finance, and Sales. As Chief Marketing Officer, Henna ran marketing for a $2 billion global business and as Region President she managed a $600 million P&L. As Country General Manager in Mexico, Henna and her 600-member team tripled the rate of innovation and successfully turned around a business that was losing share and profits. She was recognized by Novartis (a global pharmaceutical company of 90,000 associates) in 2006 for their top Performance Excellence award. Henna brings significant global experience, having lived or worked in seven countries across four continents. She is elected to the Board of Directors of Engro Corp., one of the largest publicly traded companies in Pakistan, where she also serves on the Board Compensation Committee. She is a frequent speaker on leadership and a blogger for Forbes. She has appeared on Fox Business, NPR, and is quoted in Fortune/CNN/Money online. Henna received her MBA from the Wharton School at the University of Pennsylvania, and completed Executive Education programs at the Harvard Business School. Hunter Prendergast is a former nuclear reactor operator, solar system designer, and computer engineer who has been working with blockchain technologies since 2015. Prior to co-founding MIMIR Blockchain Solutions, he built secure hardware devices, developed automated trading algorithms, and researched alternative applications for the Ethereum blockchain. Beverly Wright has spent over twenty years leading and executing Marketing Analytics and Modeling through corporate, consulting, and academic experience. Prior companies include Cox Communications, SunTrust Bank, Southern Company, and AGL Resources. In her consultative roles for BKV Advertising, CFI Group, Nielsen, and Zoom Insights, Beverly provided guidance to a variety of businesses and non-profit organizations to frame and solve critical issues using modeling and advanced analytics. In addition to her practitioner experience, Beverly was a professor of Marketing Research and Analysis, Business Statistics, Graduate Research for Decision-Making, among other courses at Georgia State University, East Carolina University, Clayton State University, and Berry College. She currently teaches Executive Education at Georgia Tech. Beverly earned a PhD in Marketing (Research emphasis), a Master of Science degree in Analytical Methods, and a Bachelor of Business Administration degree in Decision Sciences. Beverly received Professional Research Certification from the Marketing Research Association, is currently a Certified Analytics Professional from INFORMS, and regularly presents at professional and academic conferences, publishes articles in multiple business journals and conference proceedings, and maintains an active academic research agenda. Edit This Event Last Edited By: OPEN Atlanta on Oct. 21, 2018, 8:35 p.m.